Around 2.5 million years ago, the first recognized edged tools were developed when so-called “Stone Age” peoples began to fashion simple hunting tools from flint and obsidian. The impact of prolonged droughts and the constant territorial battle for a reliable source of food inevitably led to conflict between neighboring tribes. The weapons of hunting, including the axe and spear, were soon readily transformed into weapons of combat. The Neolithic period is known as the New Stone Age. 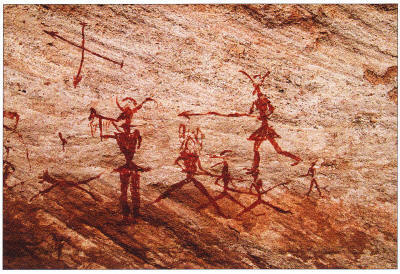 This ancient cave painting depicts a hunting scene in Libya. The first widespread use of tools occurred during the Paleolithic Age (the Old Stone Age), between c.2.5 million and 8500BC. The hand axe was the most important tool of this period and would have been designed to provide both a cutting edge and a sharp point. It is impossible to assign to these axes a purely combative role as their primary function would have been either to attack animals or to remove their flesh and hide, but the axes would no doubt have been effective as both slashing and thrusting weapons. Flint and stone were shaped and tied to a wooden handle, and then bound with animal sinew and tendons. Later, in the Neolithic period (the New Stone Age), 13,000— 8500BC, an opening was developed in the axehead to accept a handle. The Stone Age spear was one of the earliest weapons used for hunting animals. Like the hand axe, the spearhead would have been secured by tying it with sinew or leather strips to a longer handle. Hand-held flint and stone tools were gradually replaced by finely sharpened flint blades. The process of manufacturing such blades involved a technique known as pressure flaking, which involved skillfully knapping the flint with a pointed piece of hard wood or antler horn. Finely crafted examples of these laurel-leaf points were unearthed in the 1860s at the prehistoric site of La Solutré, near Macon in Burgundy. Sources of good flint were highly prized; it is thought that some communities would travel up to 160km (100 miles) in order to obtain suitable working materials for tools and weapons. Such advanced tools were first used by Neanderthal man, and then Homo sapiens, around 35,000BC. Homo sapiens and later sub-groups (such as Cro-Magnon man) began to create semi-permanent agricultural settlements in the Old World between 35,000BC and 10,000BC. This is an Archaic period Clovis spear point from the Americas. The Archaic period preceded the adoption of farming. Following the end of the Ice Age (10,000BC), humans began to make the transition from semi-nomadic hunters to creators of established farming communities. The practice of agriculture began in the then fertile plains of Mesopotamia (comprising present-day Iraq, Turkey, Syria and Jordan). The natural requirement for defense of these settled areas also coincided with the development of more robust, edged weapons. One of the earliest excavated farming settlements can be found in the village of çatal Huyuk (c.6700—565OBC) in central Anatolia (present-day Turkey). Numerous pressure-flaked projectile points and simple flint daggers were found during excavations, and indicate that the use of tools, whether for domestic or defensive purposes, had become an important part of daily life. Paleo-Indians are believed to be the first people to have inhabited a large number of areas in the Americas about 11,000 years ago. It is thought that they were nomadic hunter-gatherers. Paleo-Indians are understood to have hunted with both fluted, stone-pointed wooden spears and the atlatl (a leveraged weapon that fired short spears). In addition, they probably foraged for edible plants. The Archaic period (8000—l000BC) is characterized by subsistence economies supported through the exploitation of nuts, seeds and shellfish. Between l000BC and AD 1000 Woodland Indians hunted small game and foraged in the forests. Archaeologists believe that during the Paleolithic Age, points or darts were attached to short wooden shafts and then mounted into sockets on heavier spear shafts. This created a form of reloadable, hand-held spear, or at/at! (taken from the Aztec language, Nahuatl). The back end of the spear was fitted into the atlatl. The thrower would hold the atlatl and its flint dart in place, with the elbow bent and the hand resting beside the ear. A forward motion with the shoulder straightened the elbow and the wrist flicked the atlatl forward, creating the necessary momentum to propel the dart at great speed — an action which has been compared to that of a fly fisherman casting his line. Atlatl weights, commonly called “banner stones”, are wide and flat shaped, with a large hole drilled into the centre. This may have been a clever improvement to the design as it made the atlatl quieter when swung, so it was less likely to alert prey or other hunters. However, another theory suggests that the banner stone was carried primarily by hunters as a spindle weight to produce string from natural fibers gathered while hunting. Atlatls are thought to have originated in North Africa over 25,000 years ago. These weapons have been recreated in modern times and shown to have the potential to kill animals at 40m (l3lft). Despite their obvious capability to kill humans, they are more likely to have been used for hunting and bringing down big game. Great skill would have been required to wield such a weapon although its accuracy tends to decrease when used over larger distances. The atlatl-thrown spears, called darts, consisted of a feathered mainshaft and a shorter foreshaft to which points were fastened. The spears ranged between 1 .2 and 1 .6m (4 and 5ft) in length. A refinement was to add a banner stone to increase resistance.